Add opulence and elegance to your ceilings. Pure drama the Opulent Crystal Pendant Ceiling Light will draw the eye upwards and looks as though it belongs in an opulent boutique hotel. Lines of clear crystal sweep from the polygonal black finish iron frame. Six small bulb fittings are attached to the centre of the frame which when lit will cast beautiful reflective light across the room – a stunning luminous effect. To install the ceiling light feed the bow tie hooks through each hole of the frame of the ceiling light and then starting with the smallest clear crystal sweep, build up each section diagonally, finishing with the largest crystal sweeps as the outer section of the ceiling light. 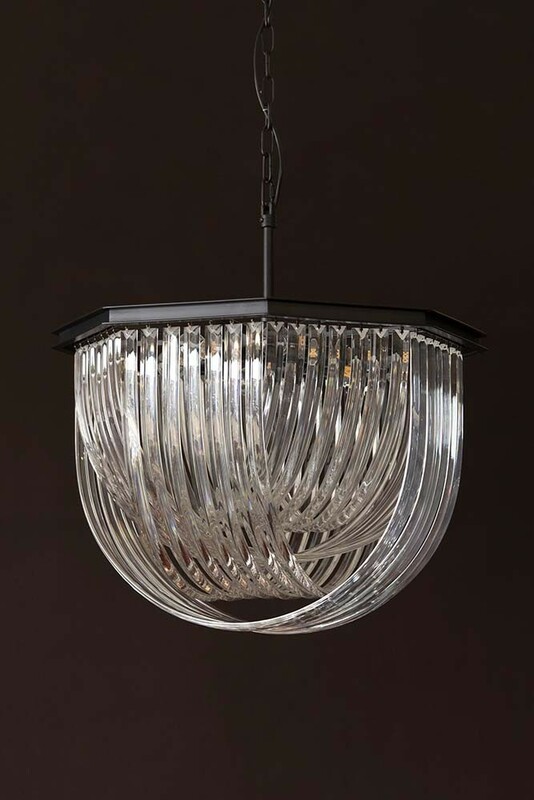 The perfect statement ceiling light for your living rooms, dining rooms, bedrooms, hallways and kitchens, the Opulent Crystal Pendant Ceiling Light will elevate your interior design...effortlessly!